My 23-year-old sister is getting married in May. She has asked me to be her matron of honor and Miss M to be the flower girl. She has also asked me to sew her wedding dress! That means between now and My 8th, I need to sew 1 wedding dress + muslin, 1 matron-of-honor dress + muslin, and 1 flower girl dress + muslin. Whew! 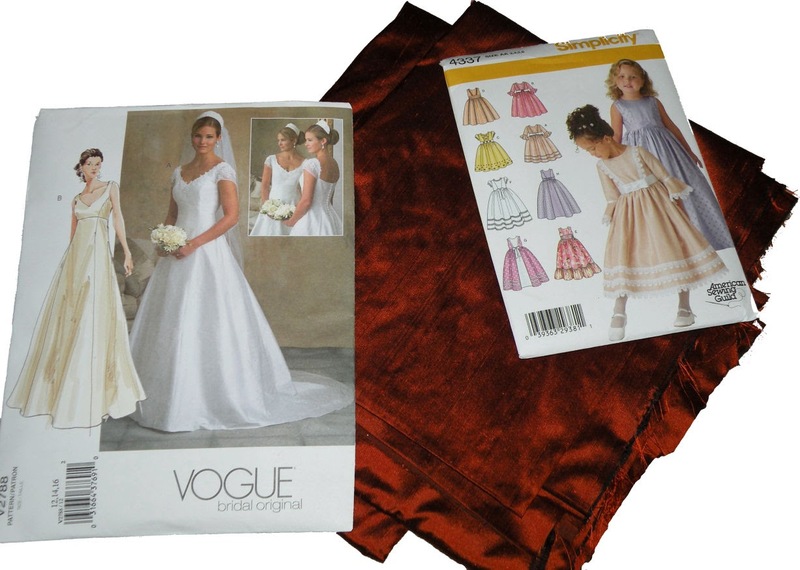 She picked Vogue 2788 for both her gown (sleeveless, long, and fuller if possible) and mine (with sleeve and knee-length). She and I have completely different body types! She's long in the torso, short in the legs, and somewhat heavyset. I'm built much more petite with a very short torso. Still, I think this style can be flattering to both of us...if I do it right. And that seems like a mighty big if! I'm quite nervous about it... It's one thing to sew cute stuff for my own kiddo, but it's another thing entirely to sew a wedding gown. Sure, I made my own wedding dress, but I only had myself to please. My sister is a romantic...so I know she has these grand idealistic visions of what she wants her wedding to be like. She's one of those girls who started planning her dream wedding when she was just 5 or 6 years old. I, on the other hand, never gave much thought to a wedding until well into my college years. I just don't want to disappoint her, ya know? She wants to loose some weight before the wedding, which makes sewing for her a tricky thing. I told her I'd take her measurements the end of March...that'll give me the whole month of April to sew her dress...during which time she is forbidden to change sizes. I, on the other hand, have long since gone back to my pre-pregnancy weight and size, so I'm not too concerned with changing between now and then. My body doesn't fluctuate much. All I need to do is get a properly fitting bra so I can get started on a muslin for myself. Once mine is done, I'll do Miss M's since I doubt she'll grow much wider, even if she grows taller between now and then. Miss M's and my dress will be made of a gorgeous rusty orange dupioni silk. It looks much too red in the picture above. It'll be gorgeous with her skin! The style will mimic mine as much as possible while still looking little-girlish rather than "small adult." I've never worked with silk before. If you have any tips, please share! I don't have any tips per se about sewing silk but when I did my girls dresses out of satin for their cousin's wedding, my sewing guru (my mom) told me to use "silk pins" for pinning the fabric together. They have a narrower shaft and sharper point than regular quilting pins so they damage the fabric less. Oooh, thanks! I'll have to look for some.